In a March 2017 blog post, EMI highlighted growth in credit card outstandings across the credit spectrum for leading credit card issuers. Our recent analysis of 3Q17 10Q SEC filings for these companies shows that this trend is continuing. 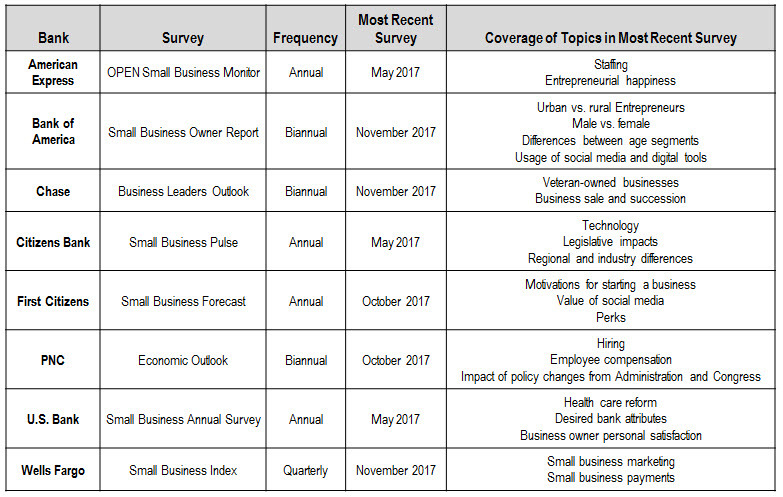 The top three issuers—Bank of America, Chase, and Citigroup—reported growth across all FICO Score segments, with strongest growth coming in the lowest segment. In the aftermath of the Financial Crisis, issuers pulled back on lending to low-prime and sub-prime consumers. With the return to steady economic growth in recent years—and with issuers now believing that they have more robust underwriting and pricing systems—issuers are now refocusing on consumers in lower FICO Score categories. Assets at both Capital One and Discover skew heavily towards credit card loans. 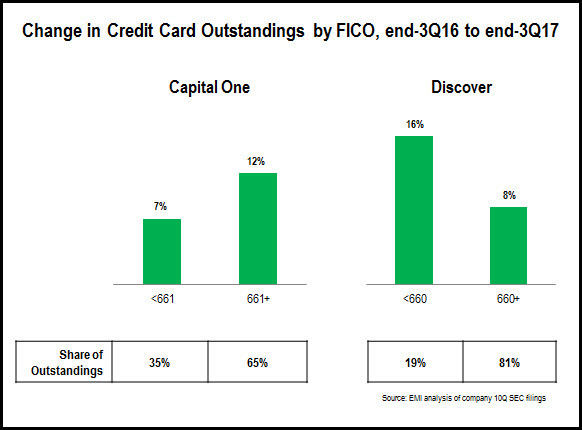 Discover generated 9% y/y rise in credit card outstandings, led by 16% rise in loans to consumers with a <600 FICO Score. Capital One bucked the overall trend, with lower growth for its <660 FICO Score segment. However, it should be taken into account that this segment accounts for 35% of its total credit card outstandings (vs. 15% at Chase, 16% at Citi, and 19% at Discover), so it has less scope for strong growth. The leading regional bank card issuers—who focus on cross-selling credit cards to existing bank clients—reported a similar pattern. SunTrust has continued its very strong growth trajectory, with overall growth of 16% led by the <620 category. Regions followed a similar pattern, with 7% overall growth in outstandings driven by a 35% rise in the subprime (<620) segment. PNC had strong growth across the credit spectrum. Fifth Third had strong growth in the <660 segment, but from a very low base. 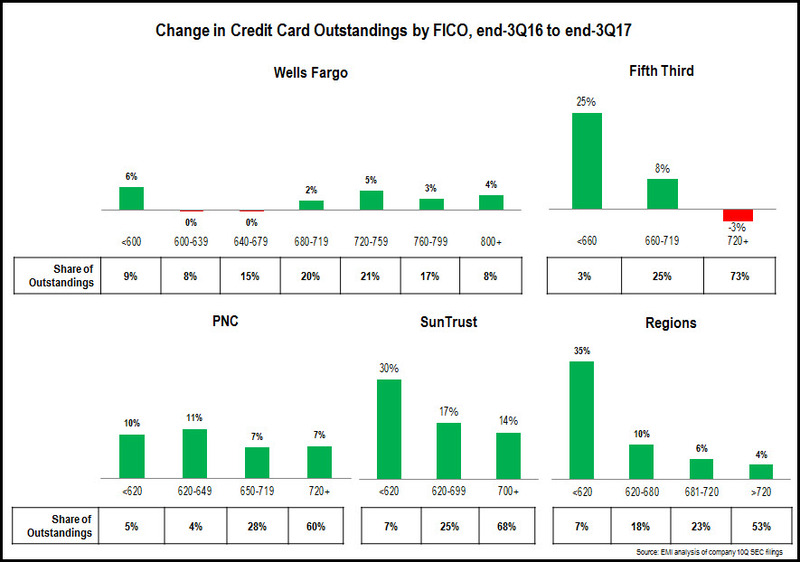 The y/y decline in outstandings in its 720+ category resulted in Fifth Third overall credit card outstandings remaining unchanged. Wells Fargo’s overall growth rate (+4% y/y) has slowed considerably in recent quarters. It generated steady growth across most categories, with the exception of the 600-680 FICO range.